WHEN seafood supplier Global Oceanlink started casting about for a business strategy to give it an advantage over its competitors, it reeled in a fresh idea - a sustainably-sourced food chain. Operation director Dennis Ng said the firm, which was incorporated during the throes of the 2008 global financial crisis, hit on the idea of catering to the growing number of restaurateurs and consumers looking for responsibly-sourced food. "We don't see ourselves merely as a seafood supplier; we give solutions to our customers, and customer service has always been one of our top priorities, as much as seafood quality," Mr Ng says. He adds: "We always work with our customers to understand their needs." Things really began to take off for Global Oceanlink when the integrated resorts Marina Bay Sands and Resorts World Sentosa began operations in 2010. They boosted Singapore's culinary scene as Michelin-starred master chefs brought their exotic menus here, beefing up demand for seafood in the process. The ones at Marina Bay Sands, in particular, were very particular about using sustainably-sourced food. "We have chefs coming from all over the world to Singapore, so the major change we saw was that, for example, Marina Bay Sands changed the entire food and beverage scene," says Mr Ng. "Their celebrity chefs wanted more premium products and were more conscious about protecting the environment." 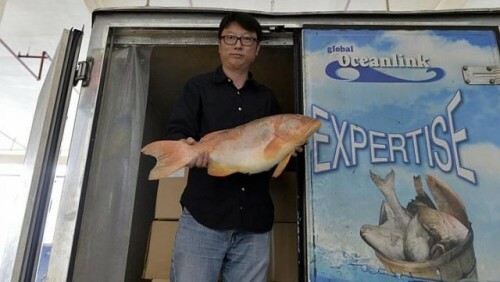 Mr Ng says Marina Bay Sands heavily influenced Global Oceanlink's decision to enter the sustainably-sourced seafood supply business as it did not want to pass up the chance of working with such a major client. The move has paid off for the firm, which derives about 20 per cent of its income from Marina Bay Sands. Its other big-name customers include fast-food franchises KFC and Domino's Pizza, as well as Dairy Farm, which operates the Cold Storage and Giant supermarket chains. Its revenue also expanded exponentially, growing fourfold since its inception in 2008. Details of revenue are kept confidential due to the keen competition in the industry, especially in the sustainably-sourced sector, which has about five players, some with lots of muscle. Most of Global Oceanlink's supply of live, chilled and frozen seafood is from fish farms, not caught in the wild and not endangered species. Only a small minority is sea-caught fish. Despite conscious efforts to use sustainably-sourced seafood, just 10 per cent of the 100 tonnes of seafood that it supplies every month is certified as such by the official green authorities like the Marine Stewardship Council. The council says on its website that it is the world's leading certification and eco-labelling programme for sustainable seafood. More consumers are demanding that their fish come from sustainable sources and, while the number is still not high, Global Oceanlink is making such seafood one of its corporate social responsibility (CSR) projects. It aims to raise public awareness and has also donated money to help educate fishermen in the region on sustainable fishing. But Mr Ng stresses that it has never been the company's policy to use its CSR efforts as a marketing tool, preferring to give to causes without much fanfare. "It's a two-way traffic situation: There must be parties willing to take up new items that are labelled sustainable but may not be popular. "We do our part by bringing in the product and try to promote it to the best of our ability, but the result may not be the best for our business." One reason is that sustainably- sourced seafood is 10 to 20 per cent more expensive. But Mr Ng says that can be countered by choosing the cheaper types of fish, such as sea bass instead of red garoupa. Global Oceanlink's staff strength has grown from 10 in 2008 to 40, with about half the employees Singaporean, a fact that Mr Ng is proud of. "We do not rely heavily on foreign workers because we do not see the need to do that, unless it is a job... no Singaporean would take up, like butchery service." Having trawled the local market, Global Oceanlink is now looking at casting its nets further afield. It is thinking of taking its supply model to Malaysia, where it already has close business links. Mr Ng points out: "We're always expanding, we've never stopped. Every day is a race."